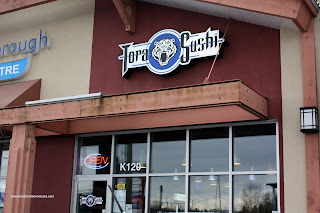 In my quest to try out every single Japanese restaurant in the GVRD, it has brought me to Tora Sushi out at Queensborough Landing. Of course, it'll take me a very long time to eat at all of the Japanese restaurants since there seems to be one every block. Well, #68 of 600 out of the way. LOL... Honestly, I wasn't holding out too much hope for this place since it doesn't seem to cater to the "authentic" crowd. After all, there is a Wok Box within the same complex. Hey, it's okay to have reasonable expectations for all types of food. After all, you can't compare Manchu Wok to real Chinese food, so I'm not going to do this here. I thought about ordering a la carte; but it didn't seem like the most cost efficient way of doing things. The prices here are actually a tad high. 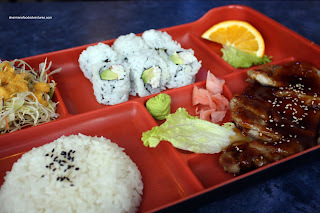 Thus, I went for the lowly bento box consisting of 3 pcs each of California Roll and Dynamite Roll with Teriyaki Chicken, green salad, rice and miso soup. I added one piece each of tuna, salmon, unagi and inari nigiri. I must give it to them, the food came out pretty quick and that suits me fine since I don't have a lot of time for lunch anyways. 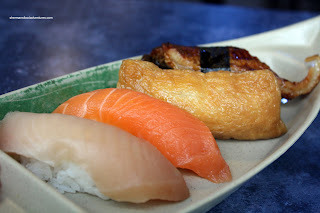 At first glance, the nigiri looked decent; but #$)#*$#)!!! The sushi rice was awful. It resembled regular rice more than Koko Rose rice. It was hard, cold and devoid of vinegar or sugar. Too bad really because the fish was decent. Tuna was a tad mushy; but it tasted alright. Of course the bad sushi rice continued on with both rolls. Again, that was too bad since the prawn tempura in the dynamite roll was quite crispy and the California roll filling was decent with fresh avocado. The teriyaki chicken was decent being moist and juicy. Not much to say about the salad and rice; yet, the rice in the box was pretty good. Not sur e if that was a compliment or pan in this case compared to the sushi rice. Now, I gotta be fair here. 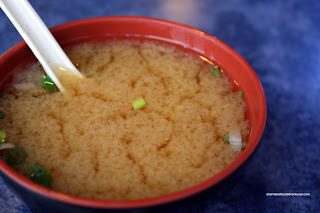 If you look at the bowl of miso soup, you can clearly see a spoon. Normally, a Japanese restaurant will not supply you with a spoon since they do not use spoons for soup. This alone indicates the intended clientele. Thus, if that is the case, then the food is not bad. If the "authentic police" had a say, well let's just not go there. LOL... no competition. Just to weed out the bad ones. I just drive around randomly. It's quite an adventure doing so! ooh, i hate bad rice. it's such a silly thing to mess up. then again, i also go around saying that there is NO good sushi in new west! better just to keep on driving... lol. glad you're there to steer us all away from the bad places though. thanks for answering my last stupid question, it's nice to be clear on that! Has anyone tried Ki Sushi in New West? I believe it's located on 8th Street. For New West, I think it has relatively decent food there. Their fish always seems fresh (every time I go at least) and I've never had any problem with the rice as like this place. LOL If you haven't tried it, go check it out! Not bad at all. I enjoyed Ki Sushi. It's owned by the people who run Dragon Palace, which at first seems a bit dodgy. But it was good nonetheless.